The grayscale reveals that she is VERY mid key. I was tricked into thinking she had wider range by leaving in the black outlines for so long. Once I swapped them for colored line all of the lows disappeared. Also on my laptop monitor her colors are terribly blown out in blue. But my 2nd monitor she is completely readable. I'll have to find some compromise. 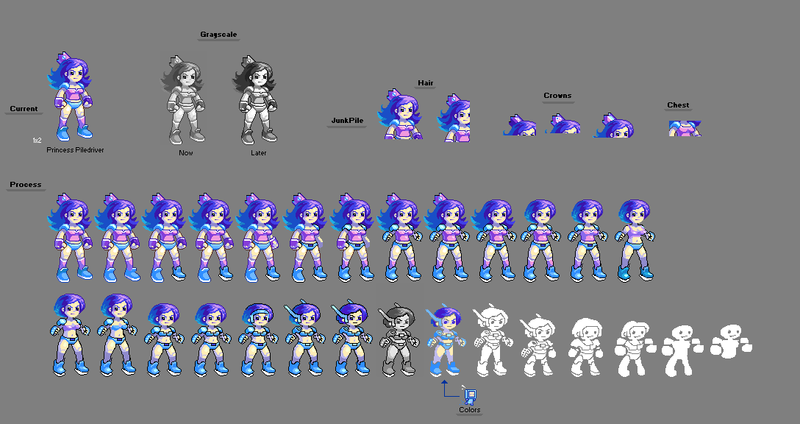 After some more passes if I get the time I'll do some animations. Piledriving robots into the ground of course. Looking far better so far! I'm a bit bothered by the lack of volume of the hair on the side with the secondary light source: with a couple more pixel clusters like on the opposite side, and it'll look great. I'm impatient to see the piledrive animation. I saw the great edit in The KKM's thread. A simple single image animation pass. 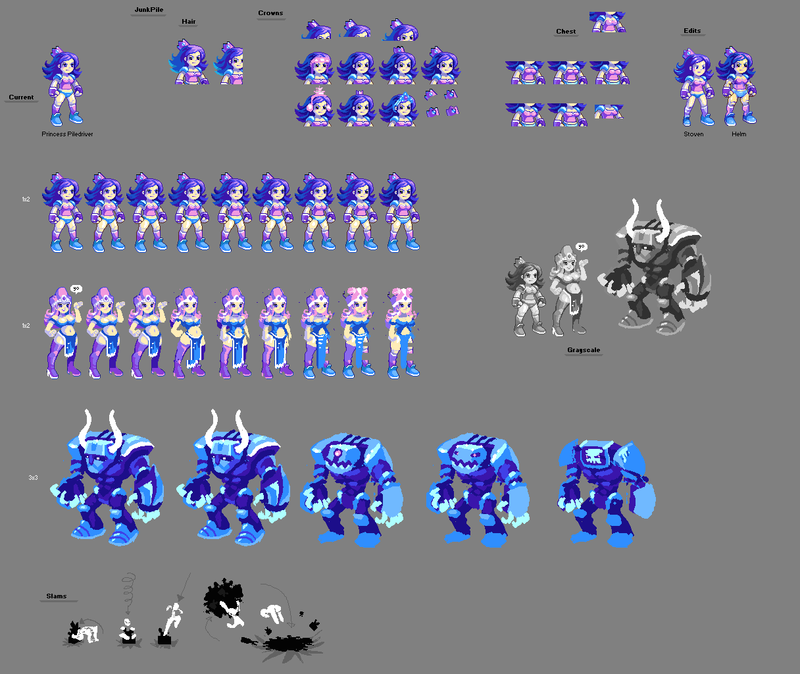 I'll end up doing a few more to figure out what I want to animate. Not completely satisfied with the final hair update. Some of the shapes are kind of blah. A few of the older ones, like the one below the last, are more appealing to me. Adding 1 darker color balanced the grayscale closer to what I want. But dropping the lighter bounce color also took something out of it. Will mess with more next time. Yes I also have strong interest in boobies. There are many different ways to draw them. The robot style isn't too bad and with some refinement could work. Playing around with different forms i decided to go with something softer. Agreed its a bit anti-gravity. I like the cartoony feel of it being unrealistically tilted. But I don't disregard the fact that something else could look better. Tried some other stuff but haven't made a decision yet. hope you dont mind, i tried an edit of your character to see what shed look like with a few things i had in mind that i would have cleaned up some if it were my character. I just kindof feel that shes looking a little chunky - i can see youre going with a stylized route, and having some 'thickness' isnt bad or wrong or anything. but perhaps thinning up the legs some and shrinking the feet would do the character's proportions a lot of good. (i left one shoe unedited, i ran out of time to finish it). what i really dont understand is why the eyes are black. giving her some proper eye whites really improved the overall look of the face i found. i really enjoy the overall color scheme she has, though i made some very minor palette adjustments on my version ( not very noticeable ones. just some values here and there that made for better transition values for AA and such). Hi. First of all, congratulations for understanding pixel art (in my opinion). These are good clusters, so little banding, and the little there is I can understand why you'd let it in there. You're paying attention to the right things, the rest will be easy for you. However this is 24 colours, for some reason. I edited down to 17 without much hassle or information loss. You can take or leave this step, I generally think controlled palettes are a good idea. Then I went the opposite way of St0ven on the forms issue, I gave her *more* curves and definition. She seems like that sort of princess. Delectable . Personally, I love the chunky/cartoony sensibility and would perhaps outline the hair also. Some kind of anticipatory war cry or psych-up as well as complimentary reaction from the red guy before the charge might lend a better sense of pent up energy & explosion. OT, I'm very interested in your animation process if you wouldn't mind hashing it out sometime, I don't think there's a dedicated (animation) thread here but a good one would surely help a lot of people. Otherwise i wouldn't be posting here. I really appreciate you guys taking the time to edit. There are tons of things that I like about both. 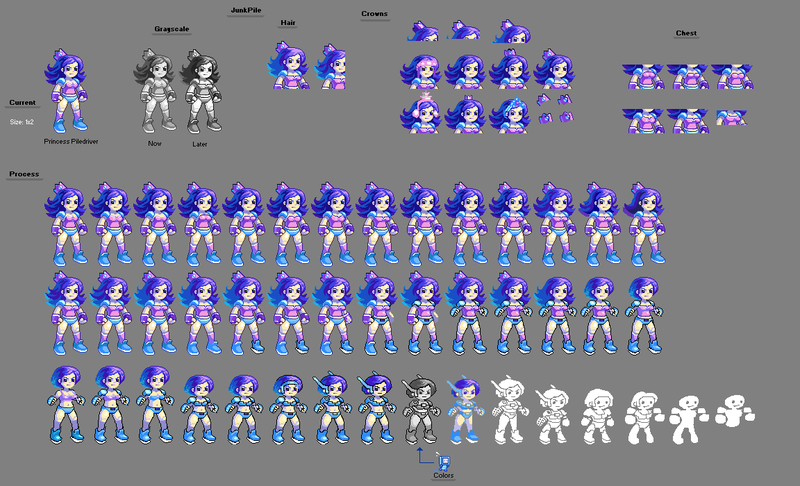 I have not yet taken into account all of them on my sprite. I like to do things manually which takes some time, as opposed to just ripping, so don't feel like I am ignoring some of the better qualities that I am missing in your edits. These colors are appealing to me so I'm interested in what else they can do. The new characters are very early, all sorts of messy, and could change quite a bit. But they are still open to crits and edits if anyone feels compelled to do so. Yes I want them to be thick. They could withstand even more chunkiness. I've been wanting to draw out a good animation guide for sometime now. But I am still unsure of the best way to go about it. Recently I've been doing edits around here on animations, but that only helps so much. Fundamentals, principles, and techniques will help people much more than me just editing their work and sending it back to them. A lot of the links I throw people aren't all that great either. It's just been faster than trying to write everything about animation ever in a single post. I'm willing to put work into it and make it nice and helpful, but if it falls off the front page and is considered necro-posting I'll be a bit sad. Perhaps a blog is the best place then? Also thanks for nice compliments everyone. Nice, I definitely love the new lady better. Also seeing this made me work on my pixel project too, so thanks. And also I didn't try it but heres my idea; idk if you like long socks but you could try making the new ladys boots just a pair of blue high heel shoes and make her purple long boot lines a very long sock, maybe lighter color though. I think she is great as it is but seeing your first character with socks made me think "What if new one had longer socks?"